Good friends of ours, Gold Medal Famous, have been in a bit of transition recently, with some moving cities, and an additional change in personal. The self-described Avant garde pop trio have always been enjoyably off the wall and very entertaining in both performance and approach to music making. Prolific is also something they are. They have a new ep being released soon. However, in a pre-emptive warm-up exercise they encourage anyone interested to remix the first track from the new release. We did our best to Rammsteinify this ear-worm, this infectiously hooky and hummable tune. And no matter what we threw at it, it remained sweet. And then the following night, the 7th, playing the album launch show for The Changing Same at UFO. Also playing with be The Fuzzies and a resurrected Eight-Living Legs. A video of the song I Robert, filmed by Roger Grauwmeijer, of RoxPx, at the Southland Musicians Club in Invercargill, June 2018. Another opportunity to experience DSLB at the Pyramid Club in Wellington. Performing with Pumice and Jason Khan from Switzerland. This weekend a very rare event indeed with DSLB, the solo project of Chrissie Butler opening for the touring duo know as HackedePicciotto. 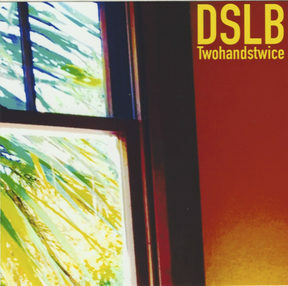 DSLB recently release the album TwohandsTwice and will be using that format of wind-powered keyboards, electric motored or manual, to set the scene for the evening. [from the AF website] “Audio Foundation is pleased to announce a nationwide tour for HackedePicciotto, stalwarts of Berlin’s legendary underground culture of the ’80s and ’90s and giants of multimedia art and industrial music. Both artists are legends of their own making: Danielle de Picciotto moved to Berlin in 1987 where she became the lead singer of the band Space Cowboys, co-initiator of the Love Parade, and frequent collaborator with the Ocean Club alongside Gudrun Gut. Alexander Hacke is founding member and bass player of avant-legends, Einstürzende Neubauten. Over two decades, the duo has collaborated in countless international projects in addition to regularly releasing their own compositions. Huge thanks to Roger Graumeijer, of RoxPx.com, for collecting great images and the following moving pictures from our recent swift South Island tour. The three recently recent album on our skirted Records were sent to Nick Bollinger of Radio NZ for potential review. And we were wonderfully surprised when this appeared. Thanks heaps for the positive clip. 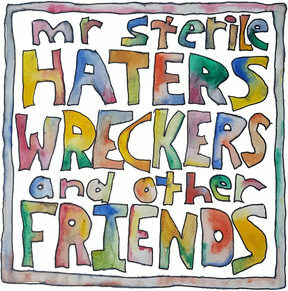 Nick Bollinger discusses the rhythms, rants and recent releases of Wellington-based independent musician Mr Sterile. Here’s an act that has travelled as far and wide and played to audiences as diverse as any band from this country ever has – though that hardly means Mr Sterile is a household name. Mr Sterile is the performing alias of Kieran Monaghan: drummer, vocalist, occasional bassist, guitarist, and – for these particular recordings – virtually everything else as well. 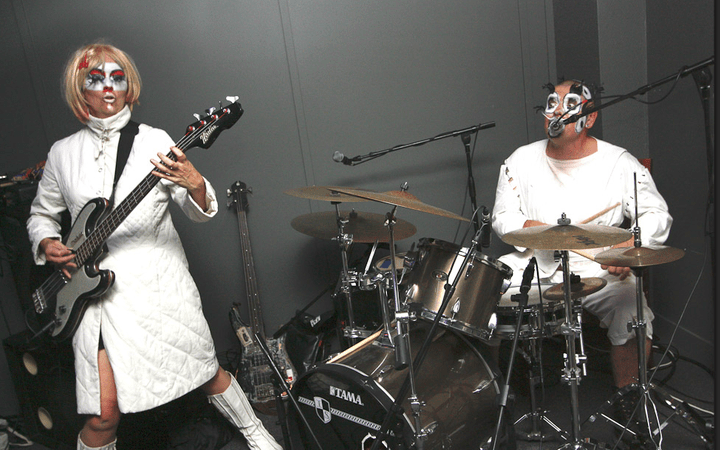 Monaghan has been performing under the Mr Sterile banner since around the turn of this century, often in collaboration with his partner Chrissie Butler. There’s a high level of theatricality about what they do. Their stage costumes are like some mash-up between Bride Of Frankenstein and early Split Enz. At times they incorporate other musicians as well. These larger aggregations are known as Mr Sterile Assembly. Otherwise it’s simply Mr Sterile, which is the case with two new releases, which are essentially Monaghan solo works – though that doesn’t mean they are not packed to the gunnels with sound. The music might not conform to any old-school punk-rock rulebook, still there is a punk impulse behind it – perhaps politically even more than sonically. The lyrics are like wake-up calls; warnings of the various mechanisms and instruments of oppression that threaten our lives. But there is a satirical as well as a sinister side to the Mr Sterile aesthetic, which you’ll find everywhere from the lyrics to the handmade packaging. Sacred cows and self-congratulation are prime targets. The first of these two recent releases is called The General Pathetic, with both its title and graphics parodying a well-known Kiwi rock classic. Monaghan’s primary instrument is the drums and this music comes at you rhythm-first. Those rhythms can be layered and complex, as in the industrial waltz of ‘Cast Adrift’, or furious and combatant – try ‘Kraschenbanger’s Return’. At other times the effect is almost folky (‘Setting Fire To Bob’). 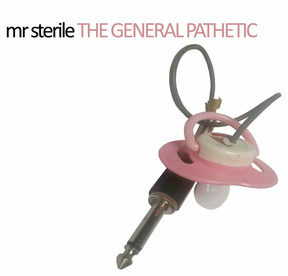 The General Pathetic was actually recorded about six years ago, though it has only just been mastered, and is the more lo-fi of the two new releases. The other album – Haters, Wreckers and Other Friends – is a bit more sonically refined, though sheer ferociousness isn’t compromised. This is music with a lot of sharp edges that seems to combine the sonic force of Fugazi with the angular rhythms of Captain Beefheart. Chimes of gamelan deepen the textures. Tracks like ‘Would We Be Alive’ imply a spiky kind of funk. A third new release, also from Mr Sterlie’s label Skirted Records, could be heard as the antidote to the other two. It certainly makes for a study in contrasts. Two Hands Twice comes out under the name DSLB (that stands for Ditsy Squalls Lunch Box) the alias of Mr Sterile Assembly bassist Chrissie Butler, and consists simply of five instrumentals played on a wheezy old pump organ. These are minimal and meditative. Built around single note drones in no discernable tempo over which harmonies are very slowly added and subtracted, it is like music in slow motion. The song of a glacier, or an organic, handmade version of Eno’s ambient music. After listening for a while my nervous system seemed to settle to where just the addition of a second note became a momentous event. But sometimes the organ is joined by unidentified rattles and bangs – it might be a washing machine in the next room – and something almost akin to a groove enlivens the drone. With these three releases out in the world, Mr Sterile Assembly are heading back on the road soon, premiering some brand new material. In the past they have toured extensively through South East Asia and Eastern Europe, places few New Zealand bands have ever set foot. But this midwinter jaunt takes them to Christchurch, Dunedin an Invercargill. Catch them if you can. There’s nothing else like it. For the first time in a long time we get to return to the south Island for a few shows. The HELLo Show is our new work in progress, a developing idea of new songs and presentation, a push back against frantic apocalyptic fantasies without denying the mounting data of impending difficulty thats ahead of us. And a bit more raucous fun. Invercargill : Saturday June 9: At the Southland Musicians Club with Murgatroyd, Otepuni Moonshine and Seafog [from Dunedin]. This work tells about my anxiety reading Indonesia now. The year 2018-2019 becomes the political year, because 2019 will pass elections to elect leaders for the people. Before the 2019 election, I already felt the chaos in every day. Today Indonesia has two camps that will [try to] seize power, unfortunately they have started a bad campaign at the beginning of the year… they are still fighting. Same issues Communist, humanitarian, Slander, Racist, Religion, Intimidation, violence all played to become rulers. And I’m forced to see it all in TV, newspapers, and social media every day, it’s like terror from all walks of life for the future that seems to be like this too. It seems that this mess is deliberately not maintained by a disorderly government or two camps. They will show off dirty wars in front of the community to show who the winner is, and I am forced to see the continuous cunning going on. Mental chaos that is nurtured continuously for voracious power. They are busy concerned with how to [gain] power and then forget people who are victims of political greed elite. This is a big problem for the survival of our lives in the home and social environment.